The Making Stories team have a new print book out and they’ve sent me a copy to review - and a copy to give away! Disclaimer: This review is part of the Making Stories Ambassador programme - a partnership where I agree to review and knit from the latest collection in return for a free copy of the book. You can find out more about this programme here and and see the other ambassadors here. In August I reviewed STRIPES from Making Stories and while I loved the collection I missed the tactile experience of the printed books created by Making Stories. I loved their first book WOODS (where I was honoured to be asked to contribute a written piece about “no-nylon socks”) and their second book BREEZE, which was filled with some many gorgeous designs I had a hard time choosing one to cast on. In the end I opted for Solano which I am still happily knitting away on. So when I was offered the chance to take a look at the latest print book for review I simply couldn’t resist. This book features 12 designs including six sweaters and six accessories. It is a richly coloured and sumptuous collection, with bold hues, shapes and styling. From the moment the first sneak peeks appeared online I knew it would be striking collection of knitwear. In this book, we included 12 modern knitwear designs for the colder seasons on this planet. From luscious colourwork yokes to drapey everyday sweaters, from a shawl as cosy as a hug to mittens designed to keep your hands toasty warm, all the pieces in this book are designed to be both enjoyable to knit and wearable for years to come. Hands down my favourite design in the whole book is Citrine! There is something about the proportion play between the boxy shape of the body and the slim sleeves that I adore. As as soon as I spotted it I knew I would have to knit it. Emily Greene, a Brooklyn based architect and knitwear designer, has been on my radar for a while and the structural details in her designs are incredible. I love that she “sketches” her design in Autocad (computer aided design programme) to make sure the grading a proportions work as envisaged across all the sizes. This blending of her architectural design training with the softer textile design process of knitwear design is inspiring. I don’t know much about CAD but I can certainly see that this technique works a treat in creating ‘cracking’ sweaters that I can’t wait to knit. You can read the interview where Emily talks about her design process, here. I have treated myself to a sweater quantity of De Rerum Natura Gilliatt in grey (of course) and have swatched for my own version of Citrine. I will be knitting this as part of the Making Stories KAL on Rav. I am hoping to have it ready to wear at Edinburgh Yarn Festival in 2019 - as there is no need for a sweater of any description here in Brisbane at the moment (as I type this we are sweltering in 36 degree weather). Texture and colourwork play a significant role in the book. One of the most interesting and unusual colourwork designs is Topaz a top down sweater with an incredible graphic colourwork yoke. I really love the ingenuity of this design! There is no shortage of colourwork yoke sweaters out there but I have not seen anything like this one before - and in a knitting world filled to the brim with glorious patterns, something this unique is pretty special. That said, I think the colourwork in this beauty is a little beyond my very limited colourwork skills so it may be a while before you find this special sweater on my needles. If you love this sweater I highly recommend taking a look at these fabulous versions on Ravelry. I love how changing the colours in a design can really alter the look and feel of a garment. If you need some guidance on picking colours for your next project the book also has a great article by Dianna Walla - I really enjoyed it. 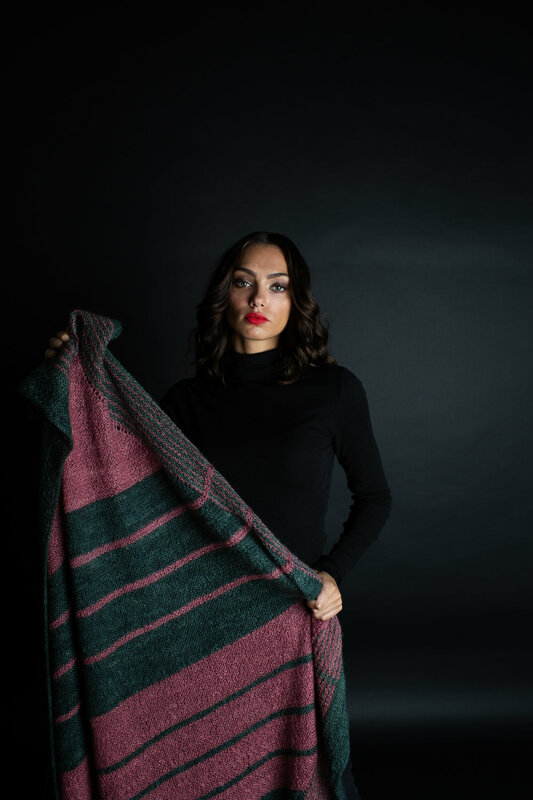 As with the other collections each yarn used in JEWELS has been thoughtfully selected and adheres to the ethical making practices that are the cornerstone of the business Hanna-Lisa and Verena (the founders of Making Stories) set out to build. A really special yarn related feature in this book is an article by Katie from Blacker yarns about substituting yarns. Learning about yarn substitution can be such a freeing process in your knitting journey. It means you can knit from stash, or buy a yarn that is more affordable or easier to source in your local area. The article is full of great tips - highly recommend it. In addition to my beloved Citrine, these are some of my other favourite designs in the collection. (top right) The lace panels in the raglan shaping are what drew me to this design. The Bluefaced Leicester / Gotland blend is also something I would love to knit with. This sweater us an elegant and fitting tribute to such a glorious yarn. (bottom right) Bold colourwork is not usually my first choice but there is something about this hat that called to me. The shapes, that contrast brim and the pompom work perfectly together. I am even planning to knit one as part of a KAL I am hosting with Colleen of Postscriptlove. Full details can be found HERE. (bottom left) Last but not least this colourblock sweater is an excellent way to play with colours I love but can’t wear near my face (mustard yellow I am looking at you!). I love the simple shape and style and the twist on the standard colourblock with a touch of stranded colourwork at the change. I love this striking collection of designs and think the engaging and informative articles make for a great read. One of the things I most like about the JEWELS is the bold and distinctive photography style. The images are not in the style I tend to see often on Ravelry or in other knitting books, where images tend to be lighter, brighter and more focussed on knitting details, than on conveying an artistic idea. I love this and think it makes this fantastic collection of thoughtfully designed pieces really stand out. Of course I realise that when choosing a knitting pattern we expect to see details to get a sense of the stitches involved and an overview of how we might create the piece ourselves. This is the part where these striking images leave a gap - while they are beautiful there are a few designs where the beautiful details of the knitted piece are a little lost in the staging of these dramatic images. Do I think this is a reason to not create beautiful images that convey far more than simply serving as a record of the knitted stitches?Absolutely not! I do, however, think that there is a balance to be struck, between art and the technical practicalities of selling a knitting pattern and feel that the current set of images could have been supplemented with some additional pictures more focussed on the details. Does this detract from the collection as a whole? I don’t think so. The images convey the overall sense of the design and the descriptive notes give a sense of construction. The sizing details available allow for a sense of the fit and the detailed schematics in the book offer all the information a knitter needs to choose the correct size. For more details and images of the designs in a range of colours, photographed in a variety of ways there are the project pages of Ravelry. I always check out the projects created by other knitters when looking at designs that I might want to knit on Ravelry! It is the best way to get a range of views on your next project, helpful tips from other knitters and to see what the design looks like in other colours or yarns. The team at Making Stories put together a lovely selection of projects in this blog post. 1) Your favourite design from JEWELS. The winner will be announced on Monday 10 December.